This is a special wood gained only from very large trees. 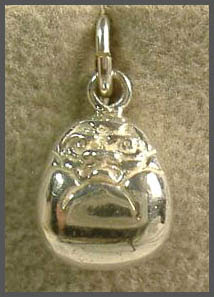 It has special whirls and patterns and a sheen of gold. 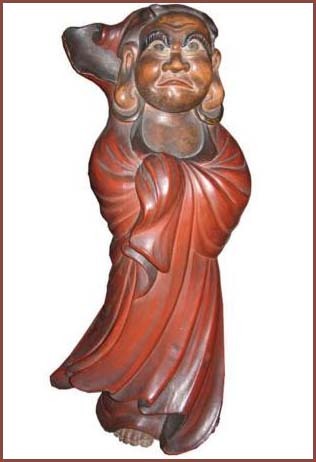 Wooden statue, maybe from the South/North period. 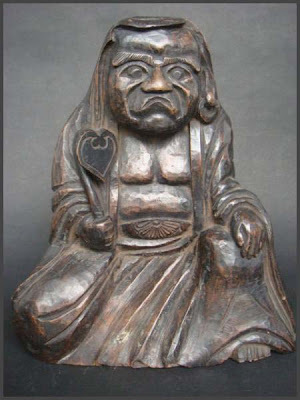 About 43 cm high.
. Fudo Myo-O standing statues . 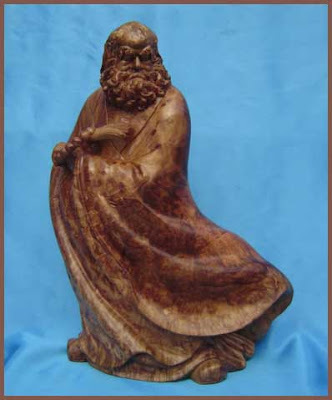 When Bodhidarma was over 100 years old --- or, at least, that is how I remember it --- he decided to spread his gospel to China. Accounts vary. All accounts vary. One story says that he rode a reed or blade of grass all the way there while standing erect, determined, composed. Other stories said he went by ship and it took over three years. There are numerous paintings of this reed-riding event as 'proof'. Once he arrived in China his message was not well received. In time, he went to a) meditate in a cave or b) before a wall. This meditation lasted for 9 years. Here again there are several versions of what happened during this period. 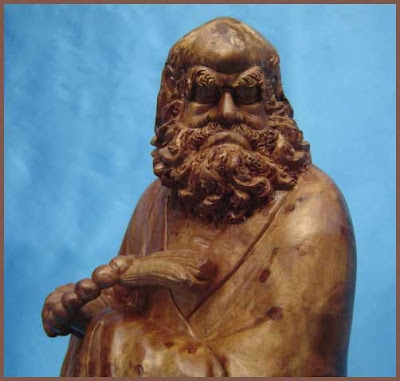 In one tale Bodhidharma is said to have had difficulty staying awake. In frustration he had his eye-lids cut off and tossed aside. Nine years of such intense concentration took their toll and his arms and legs atrophied to the point of simply dropping off. 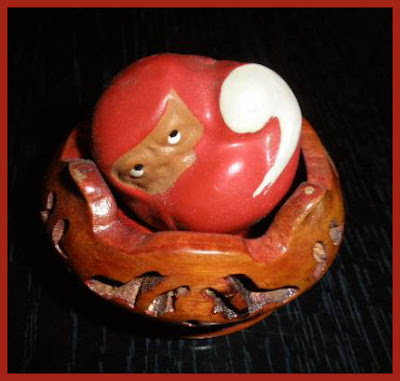 This became the origin of the roly-poly Daruma dolls which are so ubiquitous in Japanese culture. 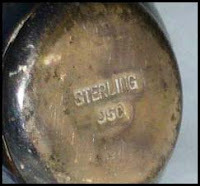 Originally they were purchased to ward off diseases such as smallpox, but in time they were metaphorically identified with other aspects of society --- in particular with prostitutes. 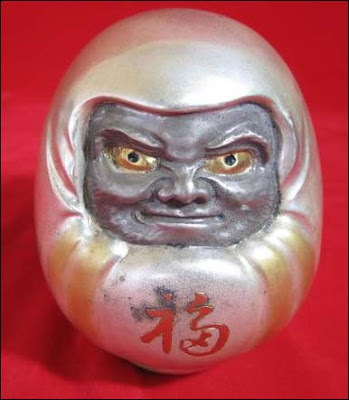 In fact, the term 'daruma' became a euphemism for a prostitute based on the principal that like the doll no matter how many times you knocked them down they always came right back up. 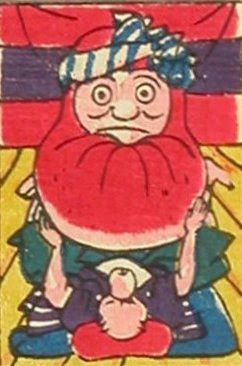 Kuniyoshi seems to have set the standard for humorous tanuki images. 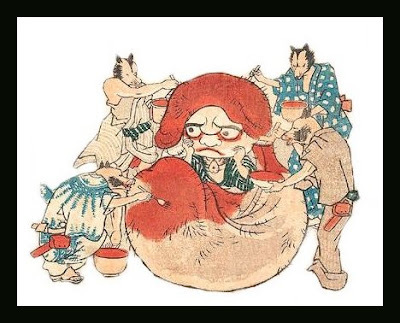 Above is a detail of a group of tanuki painting the scrotum of a fellow tanuki in the likeness of Daruma. Look carefully and you will see the tanuki which is being painted in the center of this picture. Nyctereutes procyonoides, also called badger, is still a familiar sight in rural neighbourhoods. Sometimes families with up to 12 members come to feed in our garden, while the farmer neighburs curse at them for stealing the apples and pears and digging unwanted holes. 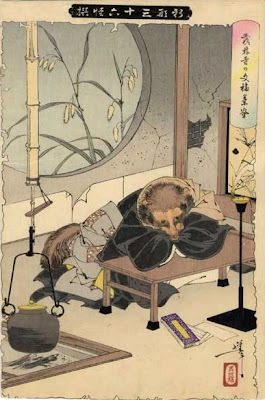 In former times farmers caught the tanuki for a hot stew in winter (たぬ き汁) and used the fur for brushes. 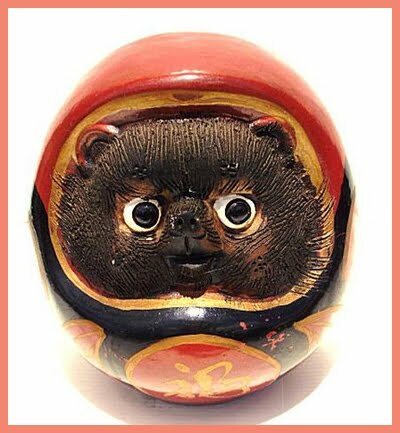 Next to the fox the Tanuki is seen as a crafty animal with magical powers, but unlike the fearful fox it is quite humorous in its tricks. 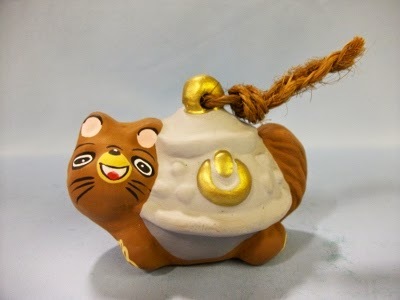 Maybe the most famous story about a tanuki is the Bunbuku Chagama, where a trapped tanuki is freed by a kind man and pays him back his kindness. Yashima-ji Temple at the heart of the South Plateau never fails to draw visitors. Spring and autumn bring a surge of tourists, picnickers and, of course, pilgrims. 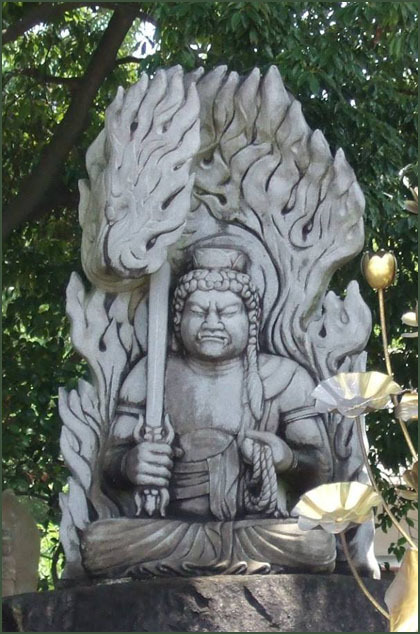 Originally this temple was founded on the North Plateau in 754, when Priest Ganjin, a Chinese Buddhist missionary on his way from China to Nara, the old capital, landed on this island to start a temple. Now it ecisits there only as a place name, Sengen-do. In 815, it was re-established here on the South Plateau by Kobo Daishi, thus becoming part of the Shikoku Pilgrimage. 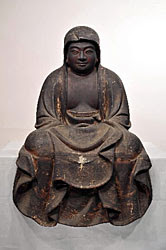 The main image, an Eleven-faced Thousand-handed Kannon, 1,200 years old, is an Important Cultural Property. The Main Hall, built in the 14th century, repaired in 1959, is also on Important Cultural Property. 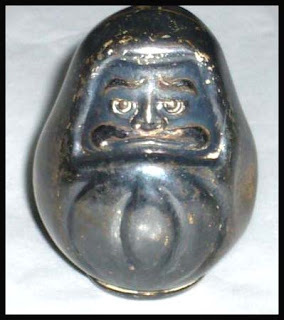 The bell in the belfry, made in Kyoto in 1223 and dedicated here for the repose of the defeated Tairas, is another Important Cultural Property. The Temple treasures in the Museum include a folding screen depicting the "Gempei Gassen" battles. Another popular place is Minoyama Daimyojin Shrine next to the Main Hall, bright with vermilion torii gates. 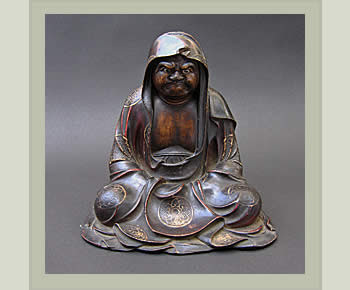 It is dedicated to a legendary bald-headed raccoon dog (tanuki) named Tasaburo 太三郎狸, an attendant pet of Kannon here. 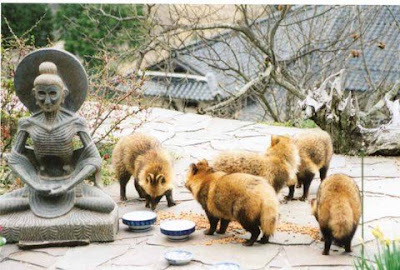 He is said to have made himself the big boss of all the raccoon dogs in Shikoku. He was unrivaled in the arts of magic. 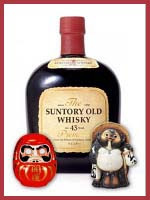 He firmly believed he was of noble stock, too, because his former master was a prince of the Taira clan. 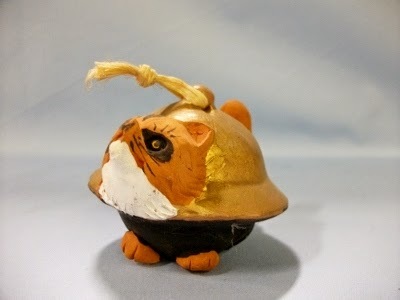 On a moonlit night Tasaburo would call together all his fellows on the Island to re-enact the "Gempei Battle" exactly as he had witnessed it, naturally with himself in the starring role. 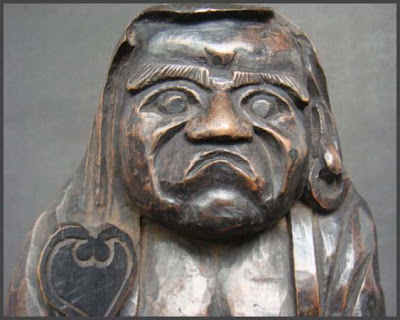 Now Tasaburo is a sort of ubiquitous mascot in Takamatsu.
. Shikoku Henro Temple List . 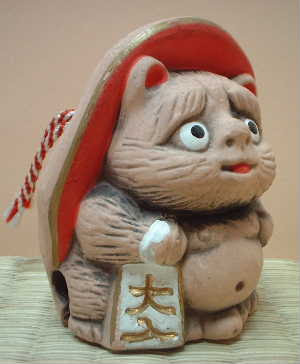 bald Tanuki from temple Jogan-Ji . The badger is taking a nap and has forgotten its disguise as a priest. It can also take the shape of a tea kettle. When a monk heats the pot, it will run away as a badger. It is chased in Morin-Ji Temple and put in a box. Then it takes the shape of a teakettle again.
. Temple 茂林寺 Morin-Ji and a fox legend .
. kotowaza　諺　/ ことわざ idioms, sayings, proverbs - ABC-List .
. Tanuki　狸 Badger amulets and Talismans .
. tanuki bayashi 狸囃子 - baka bayashi 馬鹿囃子 . 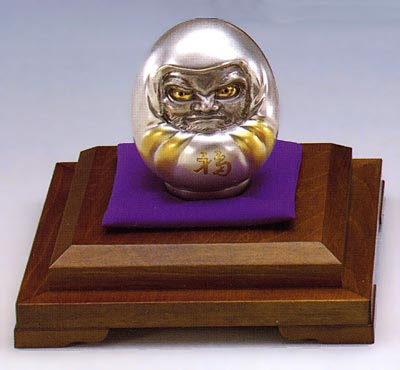 one of the Honjo Nana Fushigi 本所七不思議 seven wonders of Honjo in Edo. 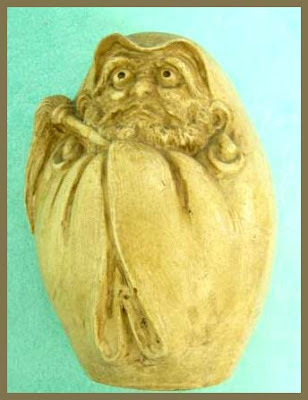 THE LEGEND tells that Bodhidharma crossed the Yangtse River on a reed and travelled to northern China. 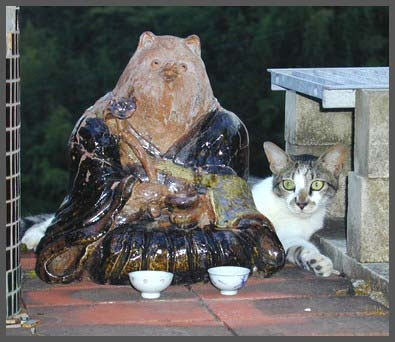 There he settled at the Shaolin Monastery and transmitted the patriarchy to Hui Ko. 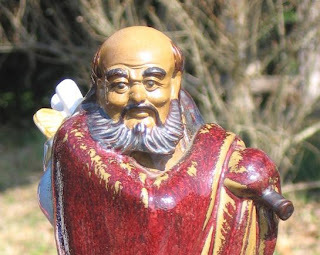 Soon afterwards Bodhidharma died in 528. 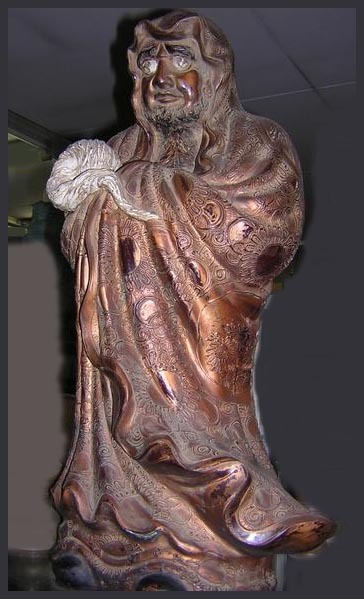 A few years after his death, a Chinese official reported that he had encountered Bodhidharma in the mountains of Central Asia. 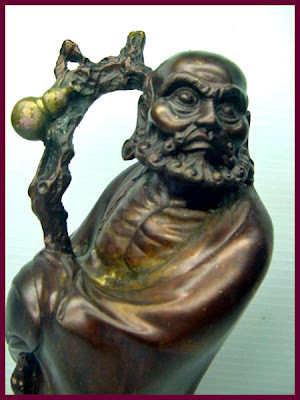 Bodhidharma was then carrying a staff; a single sandal was hanging from it. He told that he was on his way back to India. 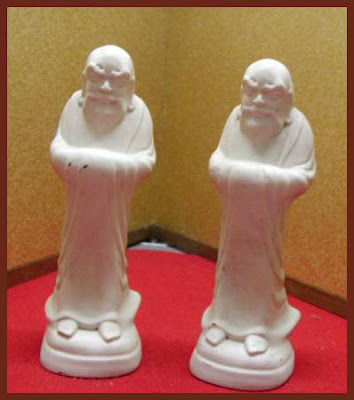 When this story reached his Chinese home, fellow monks decided to open Bodhidharma's tomb. Inside there was only one sandal. 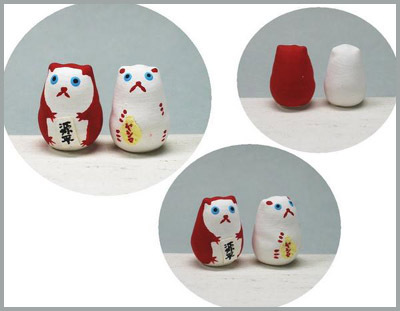 The story somehow continues in Japan. 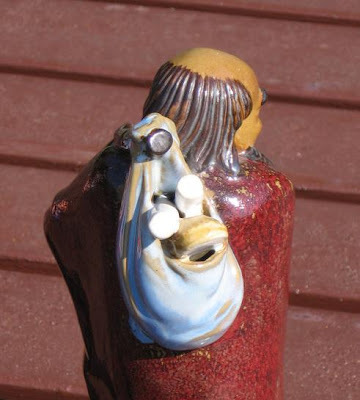 When Shootoku Taishi walked along the village of Kataoka, he met a poor man and gave him a purple cloth. But the man died the next day. When they opened his grave, there was no body found, just the purple cloth folded nicely. 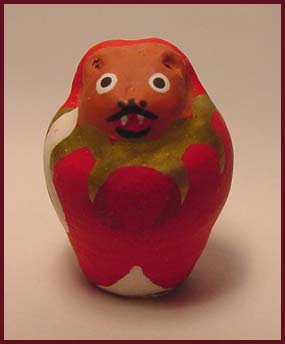 "This must have been Daruma, the Founder of Zen" was the verdict of Shootoku Taishi. So "It takes a holy man to recognize another holy man!" and the sutras in his shoulder bag! Putidamo (chin. 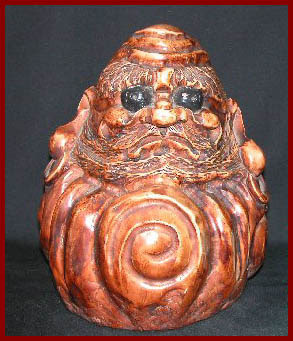 ), Bodhidaruma (jap. 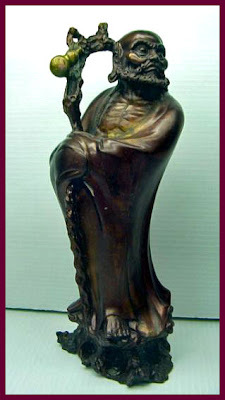 ), Indian monk, living i China in VI century and cosiders as foundator of school Ch'an. Halflegendar person and surrounded with many myths. 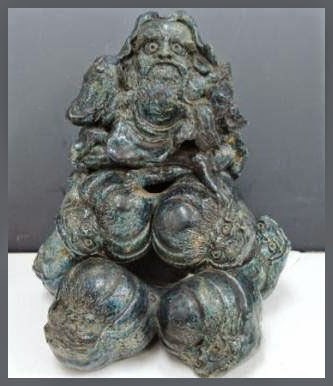 After arriving to China at year 520, he was received by Emperor Wu who had many merrits for Buddhism because of foundating of Buddhist temples and helping to monks. "Only emptiness -- none sanctity". 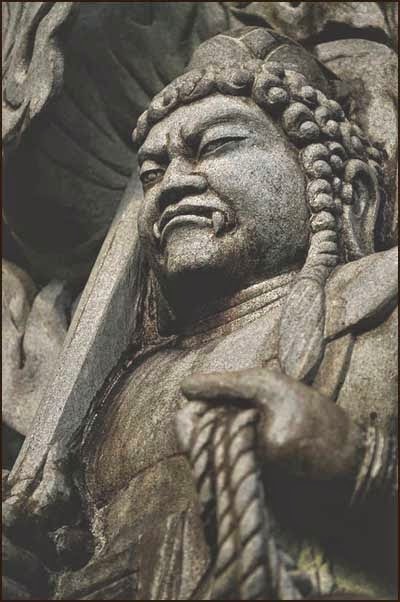 After the meeting with emperor, Bodhidharma went to Shaolin monastery, where he spent nine years facing to rock wall. Probably he return to India but before the departure pointed out his successor Huike who is considered as the second patriarch of Ch'an. 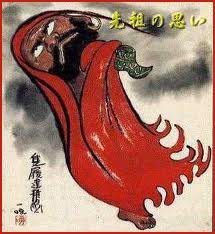 The rest is legend in curriculum vitae of Bodhidharma. 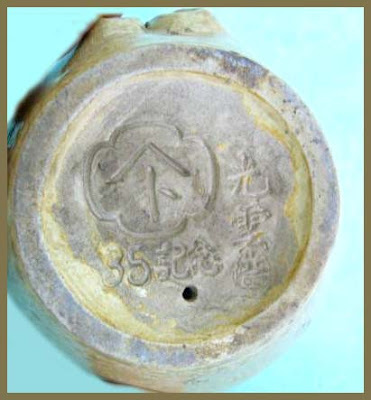 Therefore this that he swam across the river Yangtse on the leaf of rush, that he invented the tea which grew from his eye-lashes, when he cut them after he fell asleep during the meditation. He discovered the art of fighting Kung-fu. 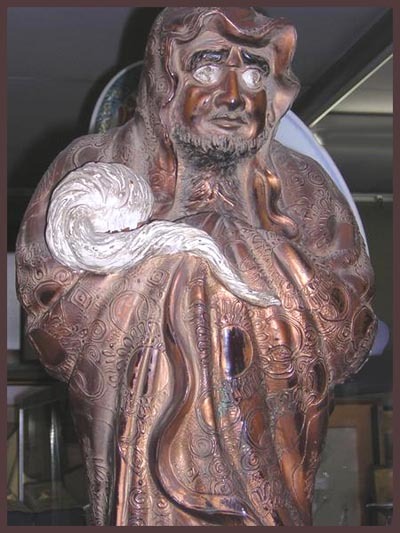 Another version told he was died when he was 150 and he was buried in Mountain Henan. Some his disciple told he met him going with one sandal. When his tomb was dug out, it was found just only one sandal. This one comes in various sizes. 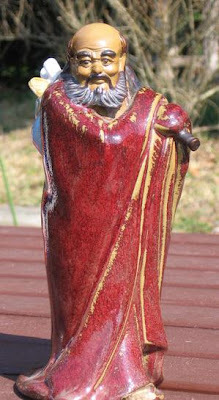 About 14 cm high. About 290 g heavy. 11 cm round the waist. Photos from my friend Ishino.